Does anyone else feel like they need to clone themselves right about now? I need at least two more of me to get stuff done in these next two weeks. Three would probably be best. One to watch the kids, one to get the gift shopping done and one to bake all of the things I want to bake. As for the real me? I would just sleep for two entire weeks and wake up Christmas morning feeling all magical and refreshed. I'm going to write this screenplay. It's going to be called "Psycho Holiday Mom" and it's going to win an Oscar. And this person will play me (for reals, click on that link and watch that video if you haven't already seen it... "we can't let people know WE SIT!"). Alas, there is just one of me and I'm trying my best to pop the stress when it starts to bubble, to keep things in perspective, to maintain the magic of the holidays (wine helps). 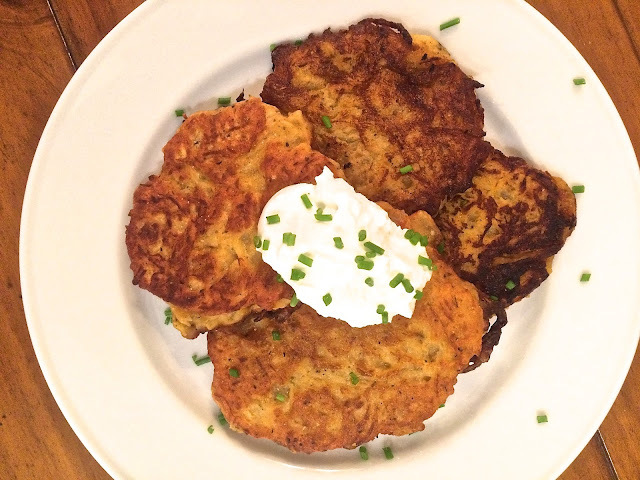 Lately, I've been looking up festive recipes online and while these aren't latkes, they are a fun variation of the crispy, veggie pancake. I found this recipe and it's spaghetti squash mixed with all sorts of yummy spices, formed into a fritter of sorts. Topped with greek yogurt and chives... I ate four for dinner. So tell me... how are you handling all of this hustle and bustle? TIPS?! I also need to be cloned and add in prepping pizza supplies for 20 kindergerteners for a holiday pizza party. Pancakes looks so delicious and tasty with spicy touch.!! Need to be cloned too - but love coming to your blog to relieve a little stress too. Thanks!